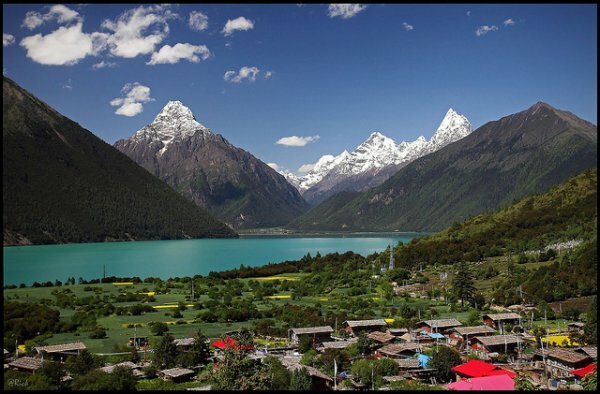 Six Tibetans from the China’s north-western Qinghai province were arrested for attempting to stop the demolition of their homes, built without permission near a local lake and which officials claim spoil the view. The order also affects Tibetan houses in the townships of Trilnak, Tanak, Chang Shey and Rigmon. The demolitions followed last week’s destruction of “illegal” Tibetan houses in Mangra County. Four more Tibetans were previously arrested on May 5, when authorities demolished their houses in Gonpo Dong in Tanak. Six Tibetans living in China’s northwestern Qinghai province have been detained by authorities for attempting to block the demolition of homes built without permission near a “scenic” stretch of lake, according to Tibetan sources. The six, who were taken into custody last week, had objected to the destruction by officials of temporary dwellings set up in Chabcha (in Chinese, Gonghe) county in the Tsolho (Hainan) Tibetan Autonomous Prefecture, a local source told RFA’s Tibetan Service. “The Tibetans living along the shore of Qinghai Lake have built houses using iron sheets in which to live,” RFA’s source said, speaking on condition of anonymity. “But the authorities have launched a campaign to demolish those structures, saying they were illegally constructed and spoil the scenic beauty of the area,” the source said. Tibetan homes built in the townships of Trilnak, Tanak, Chang Shey and Rigmon were all affected by the order, he said. Four Tibetans were detained on May 5 when authorities began to demolish houses built at a place called Gonpo Dong in Tanak, the source said. Early next morning, Gyablung village chief Tashi Gyal and a young man named Yangchuk Gyal were summoned to the detention center and were also detained, he said. “This campaign has deprived many Tibetans of shelter and is causing them great hardship,” he said. News of the demolitions followed reports of the destruction last week of “illegal” Tibetan homes in Mangra (Guinan), another Tsolho county. A total of 139 Tibetans have self-immolated in China since 2009 to protest Beijing’s rule in Tibetan-populated areas and to call for the return of exiled Tibetan spiritual leader the Dalai Lama.